What is a Speedy Rewards Pay Card? 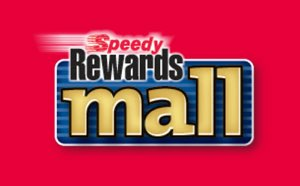 Speedy Rewards Pay Card is a loyalty/rewards card or smart phone mobile program that has been authorized to conduct an ACH debit transaction. It is a form of an electronic check with a secured User ID (PIN) for verification and security. You link your bank account to the payment card or mobile app and use it for payment at participating locations. We refer to it as your Speedy Rewards Pay Card! Will my bank place a hold on my checking account funds when I use my Speedy Rewards Pay Card to pay for fuel purchases at the pump? No! 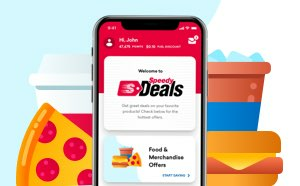 The technology Speedway implemented to process your Speedy Rewards Pay Card transaction was designed to avoid the need for your bank to place a hold on your checking account funds. Is my checking account information secure? Yes! Speedway LLC contracts with ZipLine (NPCA) to provide this service. ZipLine (NPCA) does not sell or disclose any information to a third party, including Speedway. Speedway does not have access to any of your registered bank account information. ZipLine (NPCA) complies with all National Automated Clearing House Association (NACHA) rules and regulations, which govern electronic payment processing. Your enrollment data is kept safe in our secured database servers. All bank information and PIN’s are encrypted as soon as your enrollment is submitted. How is my Speedy Rewards Pay Card used for payment? ZipLine (NPCA) has patent-pending technology that enables you to link your checking account, and a Personal Identification Number (PIN), with your Speedy Rewards card. Once complete, you can pay for fuel and merchandise at Speedway and participating locations to earn Speedy Rewards loyalty points, with one card swipe! After your card is activated, your card or mobile app (where applicable) can be used as your method of payment. An ACH debit transaction, for your total transaction amount, will be submitted to your bank account within the next three (3) business days. After my Speedy Rewards card is linked to my checking account, do I always have to use it as my method of payment? If I don’t, will I continue to earn points? Each time you swipe your Speedy Rewards Pay Card, you will be asked if you want to use it as your method of payment. If you don’t, press NO and you will then be prompted to present an alternative method of payment. However, double points on your fuel purchases are earned only when your Speedy Rewards Pay Card is selected as your method of payment. You will earn the standard program points regardless of the method of payment you choose. Why use my Speedy Rewards Pay Card rather than a regular, bank issued, debit card? Debit cards and credit cards are forms of payment that carry large merchant fees from the banking and credit card industry. Speedway’s cost of processing a Speedy Rewards Pay Card transaction is less, which allows us to offer you double points on your gas purchases. Occasional special promotions will offer you additional benefits for using your Speedy Rewards Pay Card. Each Speedy Rewards Pay Card transaction requires you to enter a PIN for security before it is authorized. Your Speedy Rewards Pay Card transaction is safer and more secure than any transaction completed with a card that does not require you to enter a PIN. Plus, you save time, earn points, and pay for your purchases with one card swipe! What fees and charges will I be assessed if I use my Speedy Rewards Pay Card? Most banks do not charge for debit transactions, also referred to as electronic check transactions or ACH (Automated Clearing House) transactions. This is the same method of payment and processing that is currently used if you pay your mortgage, car payment or credit card bill on-line. If your transaction is returned as NSF (Non-Sufficient Funds) charges will apply from your bank and from ZipLine (NPCA). 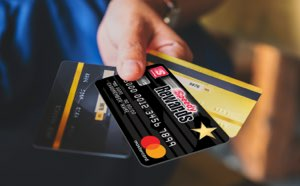 What are the usage limits on my Speedy Rewards Pay Card?